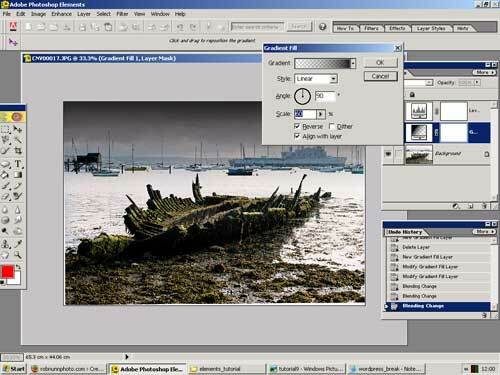 Most photographs you take could be improved with a little bit of editing, or post processing, in Photo Editing Software. 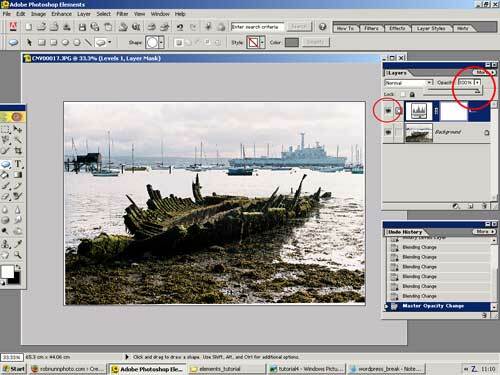 In this articles I'll be using Photoshop Elements to work on an image, just doing some small changes to try and make the photo more dynamic and have more impact. 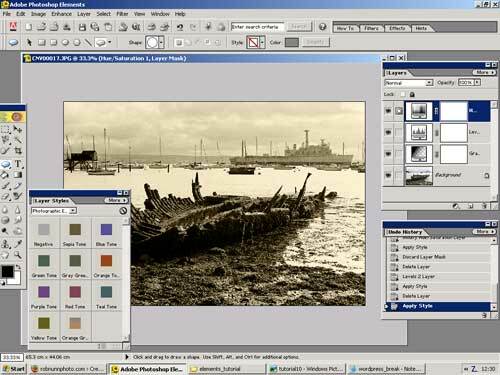 The first stage of post processing is to look at your photograph and decide what you want to do with it. What's wrong? What do you want to look it to look like when you're finished? 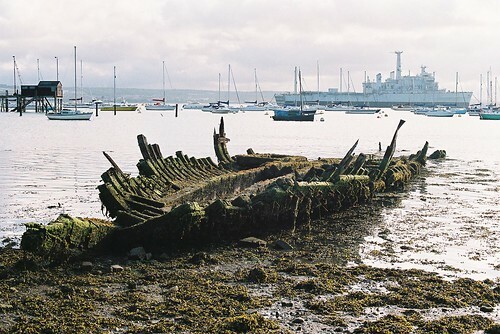 Looking at this shot, I think its overexposed - that is I'm not happy with the brightness of the sky and the Warship at the back of the picture. It could do with some more contrast - the difference between the bright parts and the dark parts. 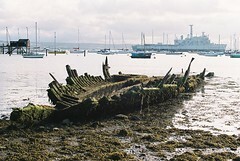 It's also a bit wonky, the horizon needs straightening. The colours look at bit muted - I might want to brighten them a bit. 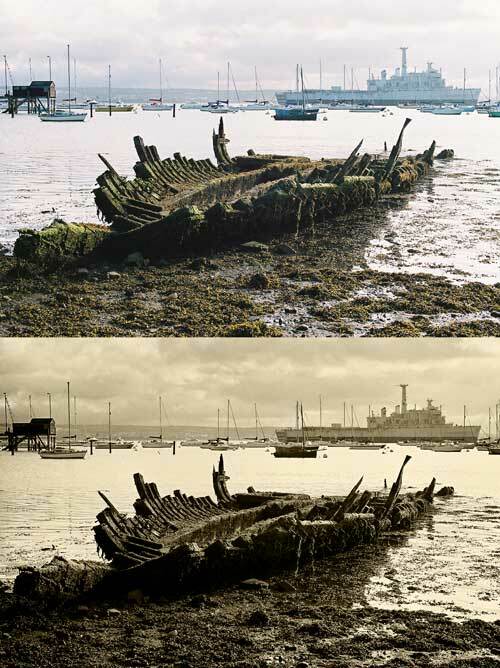 I also fancy seeing what a black and white / sepia toned treatment would look like. First up, never work on the original image! 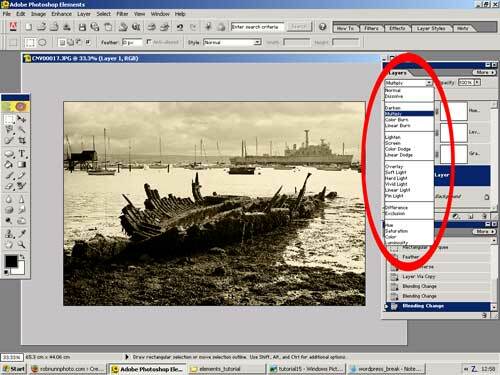 Go into the folder where you've got your originals, create a new folder, call it "edits" then copy the image there. Don't drag and drop to move it, use "right-click", "copy", then go into the "edits" folder and "right-click" "paste". Now fire up Photoshop Elements. I'm going to be using an older version, you may well find that the version you've got has a slightly different layout, or the desktop colours may not be the same. Don't worry, these techniques work on all versions, that's the beauty of Photoshop Elements! The long skinny bar on the left is the tool bar, where we can grab all sorts of cool things to work on our photo. The "palette" in the bottom right is the undo history, for going back to correct mistakes. The palette on the top right is the most important one - the layers palette. If you have other boxes on the screen, hit the little "x"'s in their top right hand corner to get rid of them. If you can't see these three, simply click on "Window" near the top of the screen, and make sure "Tools", "Layers" and "Undo History" is ticked. You can then grab the top of the palette / tool bar and move it around to get the best view. All the changes we're going to make to this image will be non destructive, and we do this by applying any edits via the layers palette. Imagine the photo on a table, and we're laying clear sheets of acetate on top of it, drawing and painting on that, not the original. This means we can go back and edit these acetates (layers) or just throw them away. This is important because we can always go back to the original image easily. First edit will be to straighten up the image. To do this let's bring up the grid - press the "view" button at the top of the screen, and click on "grid". We want a horizontal line that's close to the edge of the water where it meets the land in the background, and another that's a vertical that we can line up with something that should be straight up. 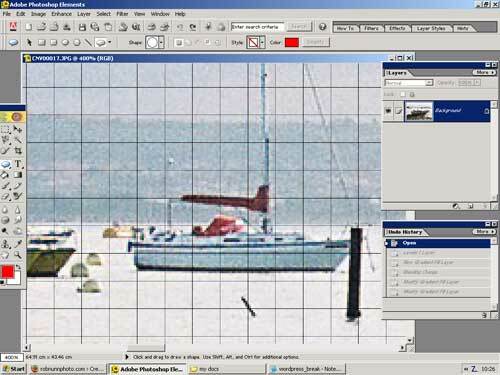 To make more grid-lines, click "edit", "preferences", "grid" and change the grid-line to every one cm. Zoom in - by holding the "ctrl" button and pressing the "+" button on your keyboard, and get a bit closer. (To zoom out, hold "ctrl" and press "-"). Have a good look at where the water meets the land, and also the black vertical post (not the yachts masts - they could be rocking on the swell). 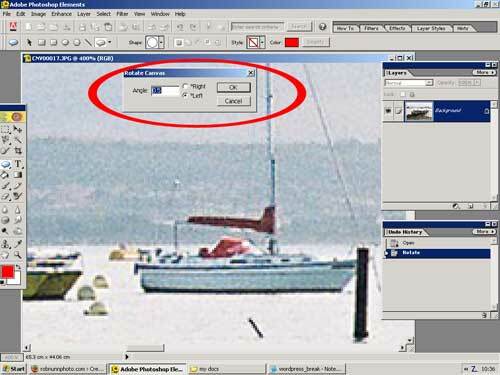 Put in a value of "0.5", "left", then hit OK.
Zoom back out ("Ctrl" with "-") until you can see the whole image. Does it look straighter? If it does, turn the grid off ("View", "Grid"). If it isn't, rotate it some more. Don't worry about the white bits at the edge of the image - we'll sort them out later with our final crop. Now's a good time to save our image in case our PC crashes. Click "File" at the top of the screen, then "save as". Make sure the format is .psd. 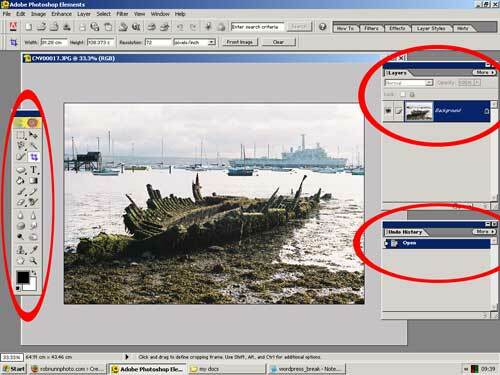 This will save our photo and our layers so we can edit it later. 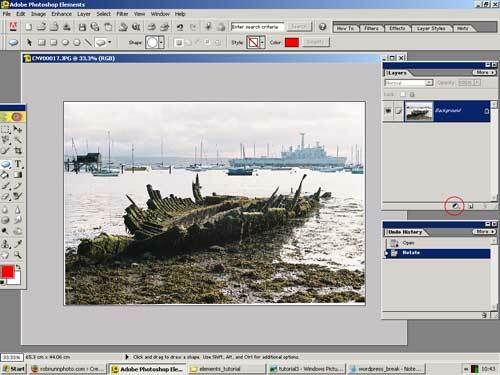 Its also a "loss-less" format - if we save in .jpg our pic will degrade, and we'll lose the ability to edit the layers. 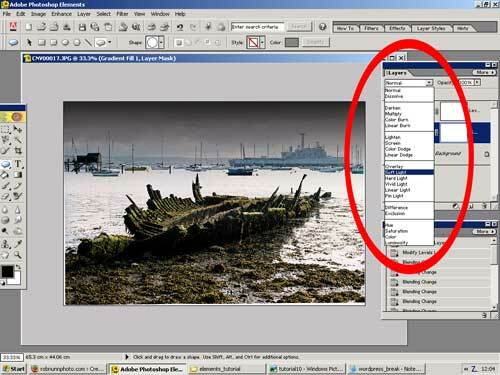 Call it something different, like "wreck photoshop edit"", and save it in a folder where you'll find it later. We're going to use this tool to add more contrast into the image, give it a little more "punch". The picture should have changed, with the blacks getting a little blacker (!). If we had a true white point or grey point (that looked a little off-colour) you could use the other two eye-droppers to set them too. We haven't really got a true white or grey, but feel free to have a play. You can reset the levels control by holding "alt" on the keyboard, and you should see "cancel" in the dialogue box change to reset. The trick here is to be quite subtle. Push the left slider (the black point) to the right slightly. Push the middle slider (the mid-tones) to the right a bit too. That should be enough. Remember, layers are fully editable after the fact. If you want to change the levels adjustment layer, just double click on the little graph in the layer, and the dialogue box will open up. Now's a good time to save as a .psd again. Now we're going to darken the sky by adding a gradient adjustment layer. 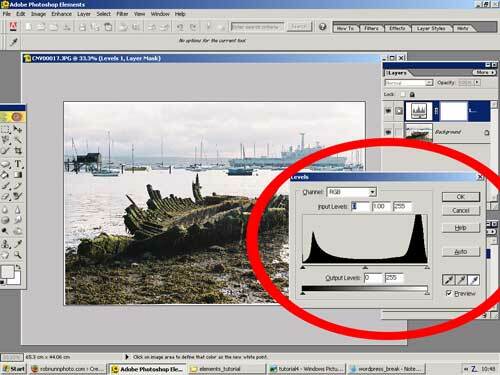 Make sure the bottom background layer is selected by clicking on it. 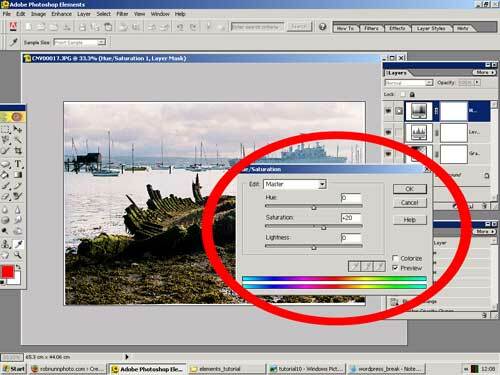 Make sure your foreground and background colours are black / white by pressing "d" on your keyboard, then you may have to switch them by clicking on the little arrow by the foreground / background colours (at the bottom of the tools pallet on the left of your screen.) 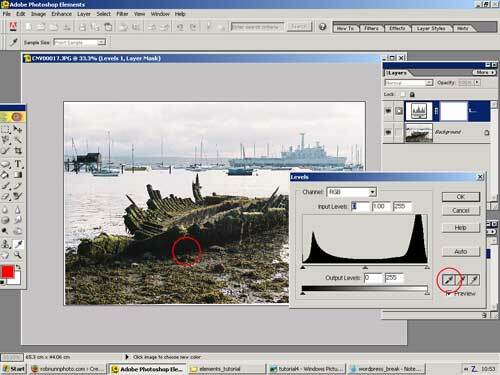 Then click on the little circle at the bottom of the layers pallet, and choose "gradient". The Gradient we want is black to transparent, so if your one isn't, click in the dialogue box, next to where it says "Gradient". Another diaolgue box will appear, and just select ""Foreground to Transparent" (hold your mouse over the gradients to get the descriptions),then press ok. Your screen should now look like the one above. Click on the little box next to "Reverse". Our sky should now be a bit darker, with a little more detail in the clouds. Now lets work on the colour. Select the top layer in the layers palette, then click the little circle at the bottom of the palette, and choose "Hue / Saturation". When the dialogue box comes up, change the saturation to "+20", say OK.
You could play around a lot with hue / saturation, try out the other colour channels, just be subtle. To use the crop tool, just click in the top left corner, then drag to the bottom right. You can then click on the corners to move them in and out to get rid of the white bits. Hold the "ctrl" button down while dragging to stop the tool "snapping" to the edges. Zoom in if necessary. Right, we could stop here, but at the beginning we said we wanted to try out a black and white / sepia treatment, so lets do that. 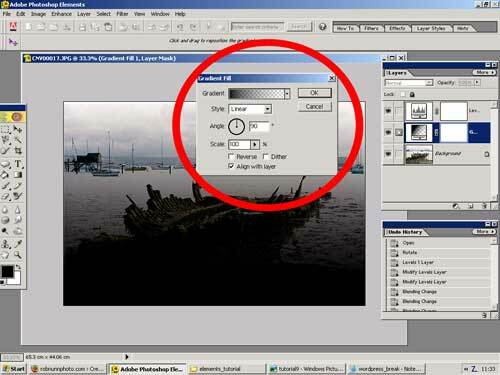 Select the top layer in the layers pallete, then click the little circle at the bottom, and create another levels adjustment layer. Simply press the ok button, don't do any adjustments. If you want to, double click on the little graph in the top layer and play around with the levels a little more to maybe darken parts of the image, but I'm pretty happy with it now. To really finish off this sepia treatment we're going to darken the edges with a very subtle vignette. Click on the background (bottom) layer in the layers pallete. Now click "select" (at the top of the screen), "feather", and enter 150pixels. This will round the corners off. Now click "select", "inverse". Now click "layer" (at the top of the screen), "new", "Layer via Copy". Ok, so what do we want to do next? We could print it out - "File", "Print", but perhaps we want to use the image on the web, on our pc for a slideshow, or share it to Flickr? If you're going to use it on your PC, or upload to Flickr, we want a good quality .jpg - so use "File", "Save As", and change the format to .jpg. When the dialogue box pops up, enter 12 for the quality, and that'll give you the top quality .jpg. 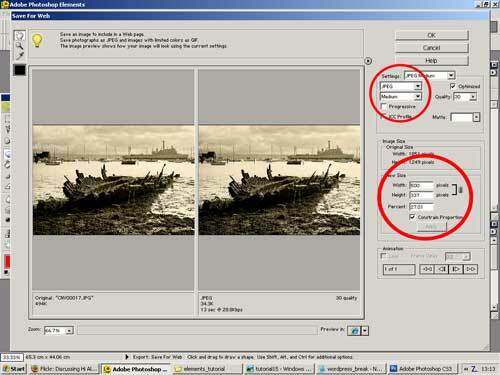 Look for the settings for jpeg, and choose a medium quality for smaller file sizes. 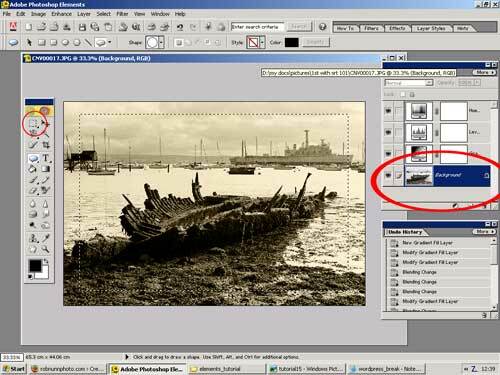 Coose your image size - 500 pixels is what I use, then press ok, and Photoshop will produce a nice, small file for you to upload. I hope this post has helped you with your Elements work-flow. We've just gone into basics here, we haven't touched upon layer masks, sharpening or noise reduction, but just practice the basics first, then grab yourself a good book on Elements, and you'll be away! Thanks Rob, for demystifying even basic elements for me. Your work flow is very understandable and I will seek to you my elements more from now on. Keep up the very useful tutorials.